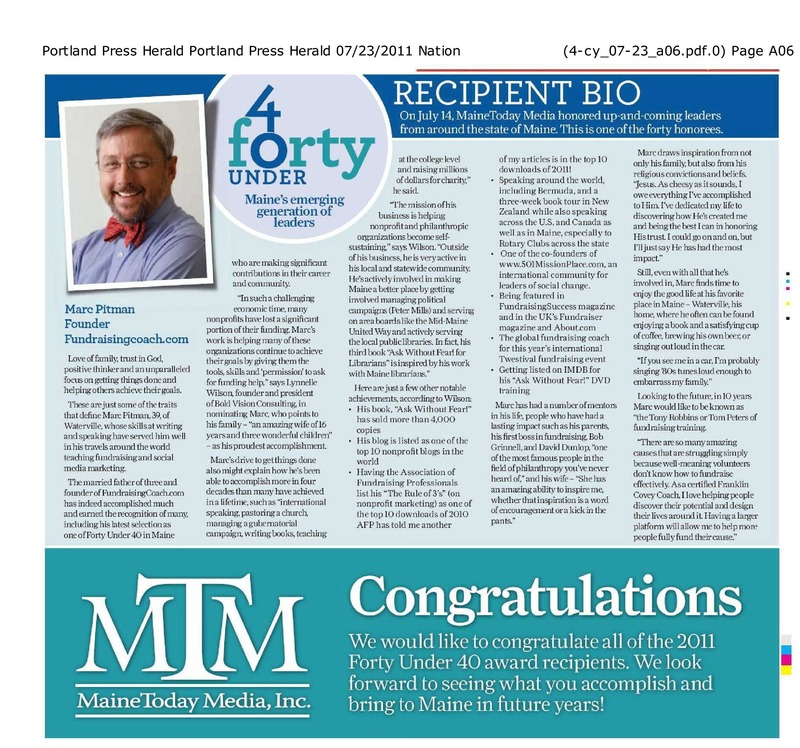 Last month, I was honored to be chosen as one of Maine’s “Forty under 40.” They went across the state looking for leaders under the age of 40 who were having an impact in Maine and in the world. Love of family, trust in God, positive thinker and an unparalleled focus on getting things done and helping others achieve their goals. These are just some of the traits that define Marc Pitman, 39, of Waterville, whose skills at writing and speaking have served him well in his travels around the world teaching fundraising and social media marketing. The married father of three and founder of FundraisingCoach.com has indeed accomplished much and earned the recognition of many, including his latest selection as one of Forty Under 40 in Maine who are making significant contributions in their career and community. “In such a challenging economic time, many nonprofits have lost a significant portion of their funding. Marc’s work is helping many of these organizations continue to achieve their goals by giving them the tools, skills and ‘permission’ to ask for funding help,” says Lynnelle Wilson, founder and president of Bold Vision Consulting, in nominating Marc, who points to his family – “an amazing wife of 16 years and three wonderful children” – as his proudest accomplishment. Marc’s drive to get things done also might explain how he’s been able to accomplish more in four decades than many have achieved in a lifetime, such as “international speaking, pastoring a church, managing a gubernatorial campaign, writing books, teaching at the college level and raising millions of dollars for charity,” he said. One of the co-founders of www.501MissionPlace.com, an international community for leaders of social change. Still, even with all that he’s involved in, Marc finds time to enjoy the good life at his favorite place in Maine – Waterville, his home, where he often can be found enjoying a book and a satisfying cup of coffee, brewing his own beer, or singing out loud in the car. Is my first name now “pastor”?